In 2016 the Nintendo 64 turns 20 years old. It was Nintendo's third videogame console, produced to succeed the enormously successful SNES. Upon its release in 1996 Time magazine claimed it was "machine of the year". While the N64 failed to best Sony's enormously popular PlayStation - a console in whose early development Nintendo had a key hand - it still sold almost 33 million units worldwide and hosted some of the greatest videogames ever made. To celebrate its anniversary I'm counting down my top 20 N64 videogames; not necessarily the best titles released on the format, but definitely my personal favourites. Body Harvest is a videogame produced by Scottish developer DMA Design, whose biggest success - Grand Theft Auto - came to overshadow pretty much all of the other games that DMA produced. That is a deep shame, because there were a host of great DMA titles produced over the years and a lot of them sadly seem to be forgotten. Body Harvest is a pretty good example of that. It's inventive, addictive, challenging and in its own way rather ground-breaking. You hardly hear anybody talking about it any more though. The game's storyline introduces a species of aliens who arrive on Earth once every 25 years. Once there they barricade off a section of the planet with shield and harvest the humans trapped inside for genetic material. The player controls Adam Drake, a time-travelling agent tasked with entering these shielded-off areas in time and space and save as many human lives as he can. The game's missions were nicely varied, with the main requirement each time being keeping enough humans on each map alive. If too many humans are lost, the game ends in failure. Adam has access to a range of vehicles to help him get around each level, and each vehicle has its own particular strengths and weaknesses. Asides from specific varied goals, there is also the need to destroy the shield generator in each area in order to prevent the alien harvests from occurring there. It is a non-linear game, allowing the player to tackle areas and levels in their own order and pace. This freedom of movement around the game was pretty rare for 1998, and came after DMA achieved a fairly similar effect with Grand Theft Auto in 1997. With Adam being able to move around on foot, shooting aliens with a variety of firearms, as well as leaping into and driving vehicles, the similarities between Body Harvest and GTA are fairly clear. The big difference of course is that GTA presented this kind of action from a pseudo-2D top-down point of view, whereas Body Harvest presented its action in a fairly rudimentary but effective 3D environment. Essentially Body Harvest invented a lot of the mechanics and style that DMA would later employ on their final game before being rebranded as Rockstar North: Grand Theft Auto III. 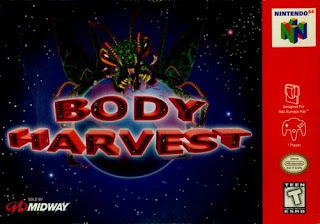 While Body Harvest may not be the most famous Nintendo 64 game - it was intended as a launch title until Nintendo blanched at the game's violence - it is definitely one of its best. As with all the titles in this countdown, it is worth tracking down and checking out if you ever have the chance.